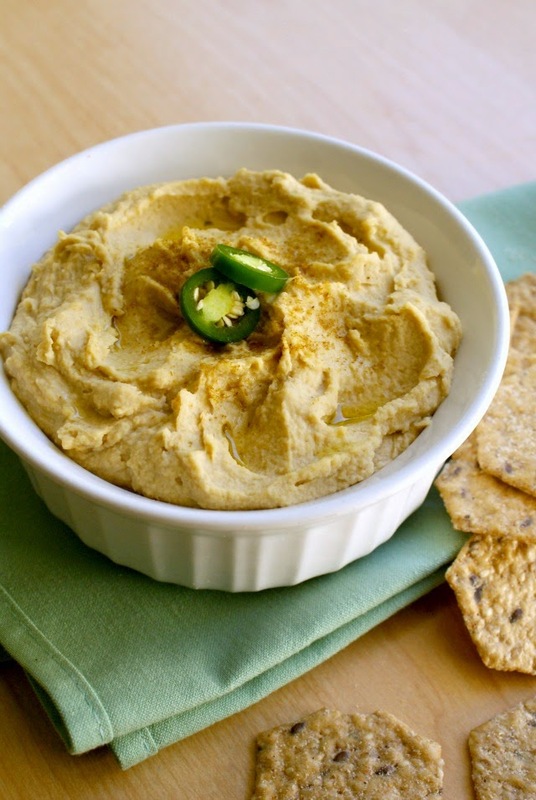 Roasted Jalapeño Hummus is a healthy dip that features smoky and spicy roasted jalapeño peppers, fresh lime juice and earthy garlic. I think I've died and gone to hummus heaven. This hummus was some of the best I have ever made, no joke. I was actually afraid that I might eat it all before I photographed it, which would have made for a pretty visually unappealing blog post. I refrained, though! I waiting until after I got the shot and then devoured it. I got the idea to make this version of a traditional hummus when I discovered a handful of jalapeños that I had harvested from our garden hanging out in the back of the fridge. I had actually forgotten they were there. Most of my jalapeños get pickled, but these last few spicy little guys were stragglers on the plant and were picked at the end of the summer. I also had a bunch of chickpeas in the pantry that had been meaning to make some hummus with, but I was feeling a little uninspired about it so I just kept putting it off. Once I saw the jalapeños, I had the ah-ha moment! Jalapeño hummus! I decided to roast the jalapeños to give this dip a smokey and mellow spicy flavor and I subbed out the usual lemon juice for lime juice, which I knew would balance the jalapeño flavor well. If you've been looking for a way to zest up your hummus, you've got to give it a shot! For more hummus recipes, check out my classic Hummus, Sun Dried Tomato Hummus, and Black Bean Hummus! Roast the jalapeños whole under the broiler for 10 minutes. Flip and roast for an additional 10 minutes, or until the skin of the pepper is black and charred. Put the roasted jalapeños in a bowl and cover it with plastic wrap. Let cool for 10 minutes. Meanwhile, in your food processor, puree the garbanzo beans, tahini, lime juice, water, garlic, salt, and cumin. Scrape down the sides and continue blending until smooth. Once smooth, stream in the olive oil while the food processor is turned on. Carefully remove the black skin from the jalapeños and discard. Slice each jalapeño in half and remove the seeds. Add the roasted jalapeños (with skins and seeds now removed) to the food processor and process until full incorporated. Serve with crackers, veggies or chips for dipping. Add one jalapeño ant a time and taste to make sure you get your desired heat! Extra roasted jalapeños can be used in other dips, in Mexican dishes, in salsa, or even stored in olive oil in the fridge. Use caution when handling jalapeños. The seeds and white ribs hold most of the heat, but is important to be aware that handling them can irritate the skin. Wear gloves, if desired. I roasted my jalapeños in the toaster oven. Easy peasy!